An RT reporter has spent a day with a group of Iraqi Shia fighters amid its final preparations for a battle against Islamic State. Blaming the US for the war and the rise of the militant group, they vow to protect their land and religious sites. “This is both a nationalistic war and a sacred war, nationalistic in the sense we are defending our land and sacred in the sense that we are defending our religious sites,” Qais Khazali, a leader of Asaib Ahl al-Haq (AAH), an Iraqi Shia paramilitary group, told RT’s Eisa Ali. The RT reporter traveled to the Taji base north of Baghdad to meet the anti-Islamic State (IS, formerly ISIS/ISIL) fighters. “ISIS we are coming, just wait a few days God willing, we won't leave one of them alive,” the young militia fighters vowed. “They did so with their policy in Syria. But we are present everywhere fighting against ISIS,” Khazali said. Between 2006 and 2007, Asaib Ahl Haq launched some of the deadliest attacks during the American occupation that lasted eight years, from 2003 to 2011. AAH troops are said to be trained by Iranian forces and Hezbollah. Khazali was kidnapped by US troops in 2007 for killing American soldiers, but was released in 2010 in a prisoner swap in exchange for four UK citizens who had been taken hostage by AAH in May 2007. Now Asaib Ahl Haq has been credited with retaking some key territories from IS, including Saddam Hussein’s hometown of Tikrit. Apart from Islamic State militants, the group also fought Syrian rebels, as well as Al-Qaeda affiliate Jabhat al-Nusra. When Mosul fell last summer, most of its fighters headed back to Iraq to fight radical Islamic groups there. It has been almost a year since Islamic State hit the headlines. They invaded huge areas in Syria and Iraq. The militants captured Iraq’s second city of Mosul (population 2.5mn) in June 2014, as government forces retreated from the country’s Sunni stronghold. The city remains in IS hands, with minorities persecuted and people being killed. IS has seized one-third of Iraq over the past year. 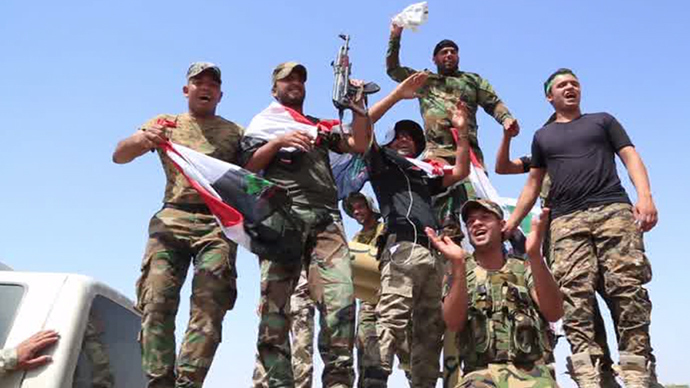 It now controls two provincial capitals, as well as the city of Fallujah. Forces have retaken Tikrit, northwest of Baghdad, but many of its residents have been unable to return due to buildings being rigged with explosives. While both the international community along with Iraq and Syria are struggling to bring Islamic State down, jihadists threaten to seize more territory and improve its fighting efficiency. In May, in its propaganda magazine Dabiq, IS announced it was aiming to develop a weapon of mass destruction (WMD), saying with the pace it was expanding it would buy its first WMD within a year.